The mosaic, posted here with permission, was created by Marco Di Lorenzo and Ken Kremer using seven scenes captured by New Horizons’ LORRI camera. 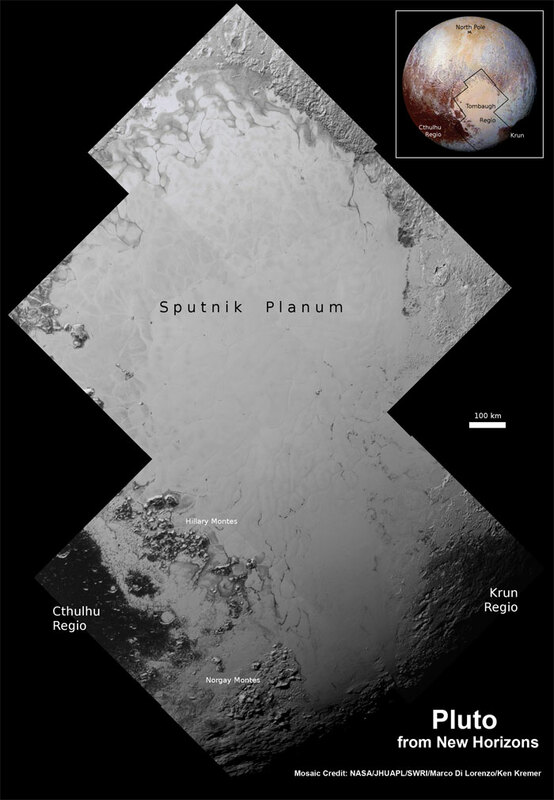 The ice field is informally dubbed Sputnik Planum, after the first artificial satellite sent into orbit around Earth. It is part of a larger feature tentatively named Tombaugh Regio, honoring Clyde Tombaugh, the astronomer who discovered Pluto at Lowell Observatory in 1930. In the middle of Sputnik Planum, views from New Horizons’ sharp-eyed black-and-white camera show blocks of ice delineated by dark troughs. The ice features, called “polygonal terrain” by geologists, taper toward the northern edge of Sputnik Planum, where streaks in the ice appear to be flows wrapping around barrier islands near a boundary with more rugged terrain. “It’s pretty big,” said William McKinnon, a co-investigator on the New Horizons mission from Washington University in St. Louis. “In fact, it’s just about the size of the state of Texas, and all around the periphery, and in the center of Sputnik Planum, are geological wonders. “At the top of the picture, it’s really different,” McKinnon said in a press briefing Friday. “There’s a rugged landscape there — a degraded landscape — and to a geologist’s eye looks like something that has been very deeply and extensively eroded. We can tell it’s old as well because you can see, with your own eye, various impact craters of large size. Unlike glaciers on Earth, which are made of water ice, the ice flows on Pluto are likely made of a mixture of nitrogen ice, carbon monoxide ice and methane ice. Water ice at Pluto’s temperatures, which are around minus 390 degrees Fahrenheit, is immobile and behaves like a rock, but other types of frozen material can move, according to McKinnon. Near the southern boundary of Sputnik Planum, the icy plain is bordered by two mountain rangers — Norgay Montes and Hillary Montes — named for Tenzing Norgay and Sir Edmund Hillary, the first two people to make a documented ascent of Mount Everest. Scientists say the peaks are composed primarily of water ice, and measurements of shadows extending from Norgay Montes show the range to stand up to 11,000 feet above the surrounding plain. A darker region on the bottom left of the mosaic, and near Pluto’s equator, is called Cthulhu Regio. Scientists believe it is part of a much more ancient geological unit than Sputnik Planum.